My name is Mary and I am from Tampa, Florida. I currently reside in Paducah, Kentucky with my husband Bill, 3 sons (Bradley, Blakley and Brentley) and 2 dogs named Max and Hana. 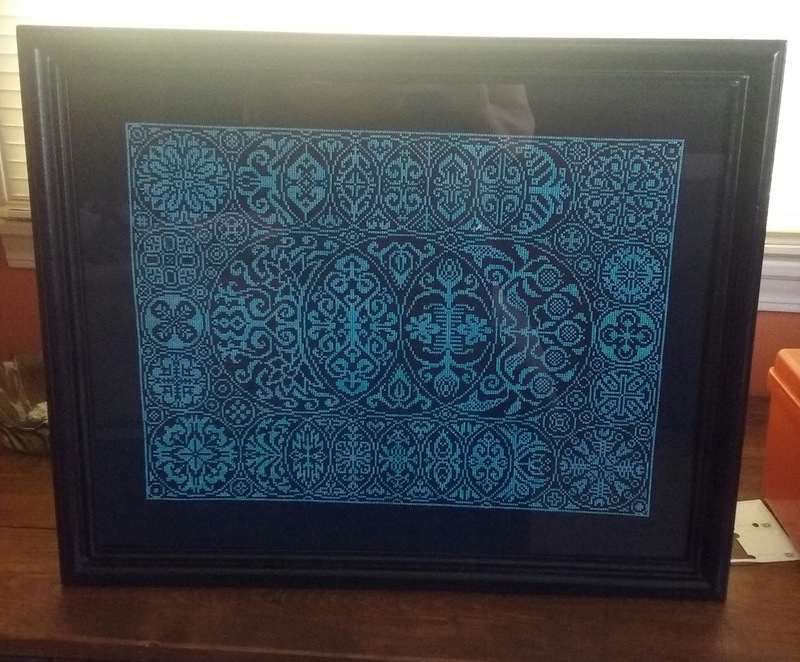 A roommate of mine showed me how to cross stitch in 1992 and I did 2 projects for my nephews. Then I stopped until 2000 when I became pregnant with my first son. I started my blog in 2011 as a way to show my work and to see my progress. I am afraid that it is kind of boring but I love some of the SAL's I have participated in this year because of my blog. My title is Mary's Stitching Spot because I was trying to make it sound cozy like sitting in comfortable pj's with a warm drink and just relaxing with cross stitch. For a long time I stitched nothing but smalls because I found it was easier with my sons when they were younger. I am now branching out to more larger and challenging pieces. I am on a journey of self discovery with my cross stitch. I use to stitch only cute/seasonal projects but I want to do more. Not ready for HAED's but you never know. I do like to rotate between projects so I don't get bored but I try not to have more than 7 or 8 WIPS. I want to try Mirabilias one day. I am on a Tempting Tangles, By The Bay and The Prairie Schooler kick. I have always loved Rosewood Manor. I love quaker designs as well. There are a few but the most recent cross stitch I am proud of is the Circle de Cirque by Ink Circles Design that I made for my son, Bradley. I also did the SAL from Palko-Lap's blog (see above) and I loved picking my own colors. I have had a few over the years. The worst for me is getting permanent pink marker on my project after it was completed and the fabric was white linen. The 2 things I have always wanted to do are Hardanger and Knitting. Not sure if I ever will but will admire other people's beautiful work. I have a small box of shame. I try to FFO projects, especially if they are ornaments, pillows or smalls. I have a basket where I put my smalls that I rotate seasonally. I need to do more for summer and spring; I tend to stitch a lot of Fall and Halloween. No matter how much I stitch I still feel like it isn't enough. Besides seasonal, I love Quaker, animals, and nature. My daisy biscornu is one of my most favorite pieces. I am very unorganized and forgetful. I am trying hard to work on this however. 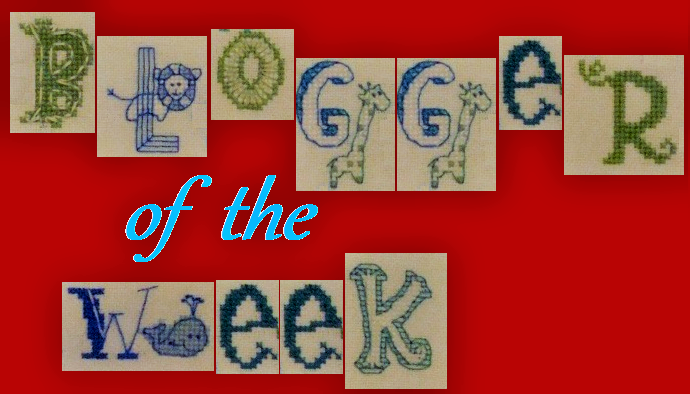 Thank you so much to Jo for finding my blog, and me, worthwhile to have as the blogger of the week. I really appreciate the time and energy that goes into it and I love to get to know other stitchers in the community. It is nice meeting you was well. Thank you for taking the time to read my interview. Great answers. Thanks for sharing Mary! I love meeting new stitchers too. Thank you for the taking the time to look at my blog and subscribing. 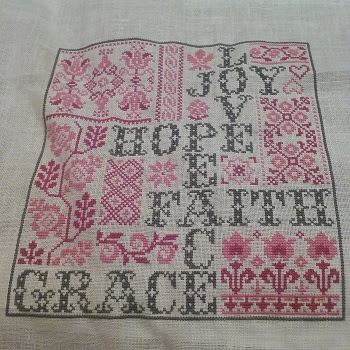 I am now following your blog as well and can't wait to go back and look at all of your beautiful stitching. It is great to get to know you too. Thank you, the Ink Circles is still my largest piece and probably my favorite so far. Thank you for taking the time to look at my projects. Small world indeed. Thank you so much for looking at my blog. Hello Mary, how nice to get to know you and your blog which I hadn't seen before. It's always great to add a new blog to my blog roll. Lovely projects that you show here. Thank you so much. I have added your blog to my list was well as a few others. I enjoy meeting new stitchers and this has been a great experience. Lovely to "meet" you Mary, and to see more of your stitching. I love the Ink Circles sampler you stitched for your son, it's striking. Thank you and it was nice to meet you too. Thank you so much. It is very nice to meet you too. Nice meeting you.Happy new Year!AriadnefromGreece!